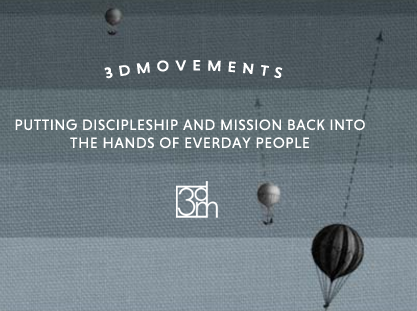 This is Part 2 of a look at 3DM, Sonlife and the Bonhoeffer Project. 3DM refers to “three dimensional ministry”. A foundational theology is that of Covenant and Kingdom. • The various shapes are a circle (seeing spiritual breakthrough); a hexagon (prayer); a triangle (deeper balanced relationships); a semi-circle (rhythms of life); a square (multiplying disciples); a pentagon (personal calling); a heptagon (communal life and health); an octagon (mission through people of peace). These shapes are not a curriculum so much as they are reference points or even tools for discipleship. Huddles are their “primary vehicle for discipleship” and the leadership training mechanism within a church. • The multiplication of these missional communities seems to be the primary goal of the movement as it relates to local churches. • These thoughts were also echoed in my interview with Cam Stutters (below). In other words, they do not see this list as so much a list of gifts or offices, but five categories or roles which every disciple will fit into. • Why did you go with 3DM? Lack of long term effective discipleship in past ministry; it is organic, real life, but also structured. • There is a tension with 3DM and existing programs. You can’t plug it into existing programs. In time it will replace what is happening.